Car = mostly buried. And there was plenty more where that came from! Snow may very well be my favorite thing in the world. If not, it's certainly right up there with chocolate, kittens...you know, wonderful things. When the first snow of the year drifts out of the sky, I can't help but do a little happy dance. Sledding, snow angels and snow men aside, it's as if Mother Nature's found a way to cover even the most unsightly parts of the outside world in a perfect blanket of white. Everything is just so...pretty! That is, of course, until what a friend calls "The Brown" sets in. The Brown - what happens when cars charge through the perfect white powder, dump trucks throw salt all over the concrete, and everything turns from the whitest of white to slush. All of that aside, I just love snow. I love how inconvenient it makes things, how much trouble it is, and how you can't do much but accept its presence and enjoy it. 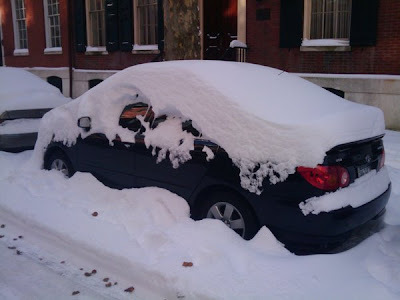 This weekend was what will undoubtedly be called the Blizzard of 2009 in Philadelphia and most of the northeast. According to the National Weather Service, Philly experienced the "second-biggest snowfall since record keeping began." Imagine the fun! That is, unless you're one of the thousands of people trying to get somewhere in the mess. I was flying back from Monterey, California Saturday morning, and as the storm peaked, I found myself delayed and rerouted all over the place, finally arriving home 25 hours late. I was more disappointed about not being able to see the snow fall and all the havoc it caused first hand than I was about losing my weekend somewhere in the depths of the Memphis and Charlotte airports. But the process reminded me of a few important concepts I tend to forget. First and foremost, we're not in control. We're part of an infinitely complicated system on this Earth, and as much as I'm sure the airlines wish they could've stopped the snow, it fell and fell and there wasn't a thing anyone could do. My favorite part of living in Alaska was feeling so completely humbled by the beauty of landscape around me, and all that Mother Nature could dish out to those of us who called it home. I was so awe inspired by how small I felt, and for the first time, I really understood what little power I had over the world around me. And it was beautiful. Mother Nature and all of her chaos - beautiful. Second, when we're confronted with being completely out of control, anxiety does little to solve anything. That's an obvious concept, but not something I'm very good at putting into practice. When things go wrong, or we find ourselves in situations that are difficult, we can control how we react to them. It took a note from Nina and conversations with other travelers to remind me of that. After work on Monday, my partner in crime and I dug my little car out of the pile of snow she was under and drove north to Blue Mountain in Palmerton, PA for a couple hours of night skiing. 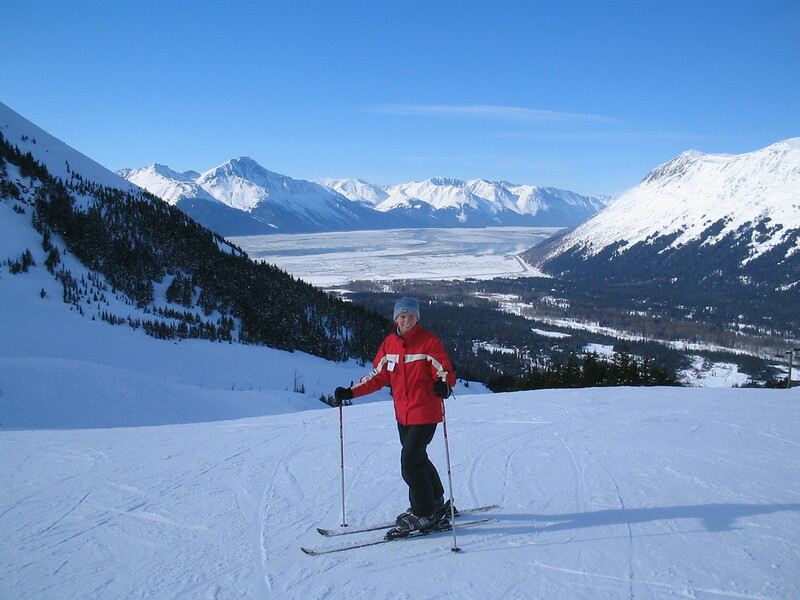 I didn't start skiing until 2007 in Alaska. I was worried about barreling down a hill completely out of control and killing myself, or worse - that I wouldn't be good at it. I'll never forget my first chairlift experience, which turned into a humiliating one after two beginning snowboarders merged into me while we were getting off and I got trampled. But a few weeks later, I was completely hooked and we were driving down to Alyeska every weekend from Anchorage that winter. Skiing here in Pennsylvania is different, but still fun and I was giddy with excitement to get back out into the snow at Blue Mountain for the first runs of the year. The snow was great, the runs were mostly empty, and it was a perfect 32ºF outside. We spent almost three hours running up and down the mountain. I was nervous to get back onto skis again, but was quickly reminded it's like riding a bike. Muscle memory is amazing, and my muscles didn't seem to have forgotten much! Of course, that was after I bit it at the start of the first run when I tripped over my poles. Even though I'm not always a willing student, my partner in crime gave me a couple of pointers and drills to try that seemed to make a difference in my skiing last year. (I'm convinced he'd have been a professional skier at this point in his life if he'd completely dedicated himself to it. Some people just have it!) Thanks to him, I've progressed from an awkward, scared, unbalanced and stiff skier to a somewhat less awkward, less tense skier. I'm hoping to gain enough confidence this winter to keep up with him and my other more experienced friends! What I did learn with absolute certainly last night is that properly fitting boots are absolutely key, just like climbing shoes. The Tecnica Vento 80 boots I bought last year don't quite fit right. ("Wait, my feet aren't supposed to fall asleep?") I'll definitely be in the market for new boots this winter, and would love to hear your favorites!